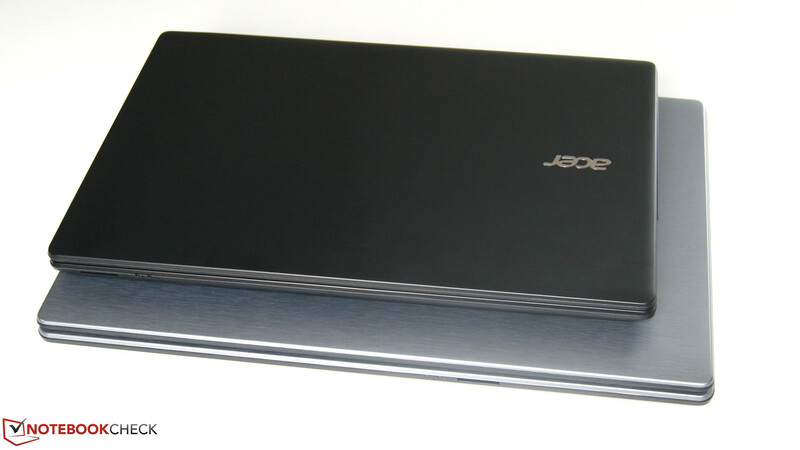 Acer is well known for its wide range of laptops. In this case, the Aspire E5-571G, with a dedicated Nvidia GeForce 840M and Intel's i5-4210U CPU, provides a compact, overall bundle for just under 700 Euros (~$920). A total hard drive capacity of 1 TB and 8 GB of working memory, a matte and a 15.6-inch screen are included. Consequently, Acer's laptop is predestined for the field of multimedia, and even gives casual gamers some elbow room. We will determine whether the internal components, in the form of input devices, interface diversity, the six-cell battery, and emissions, are convincing as a whole. Since the decision to buy a laptop should always be considered carefully, we will compare Acer's Aspire E5-571G with some competitors. MSI's GP60 with an Nvidia GeForce 840M but more powerful Intel Core i5-4200H CPU, featuring the same working memory capacity of 8 GB, but only half the storage capacity with 500 GB is considered as a rival. With a price tag of roughly 800 Euros (~$1050), MSI's laptop is 100 Euros (~$130) more expensive than the Acer. Asus' F550LN is also within this price range, and makes comparing the performance of ULV CPUs interesting due to its faster Intel Core i7-4500U. 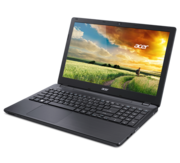 Acer's Aspire V3-573G, equipped with an Nvidia GeForce GTX 850M and a high-quality IPS screen, which sells for 100 Euros (~$130) more, completes the comparison. Like most other lines, the brushed aluminum look is appealing. 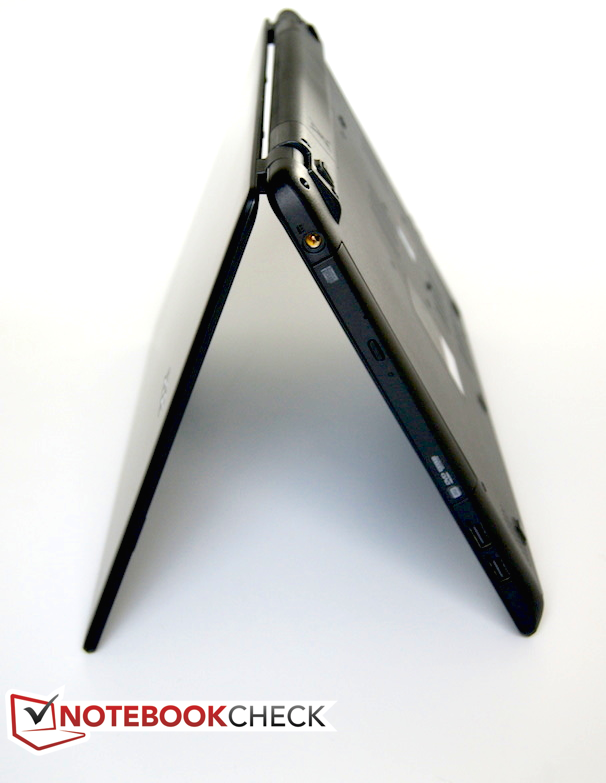 Of course, you should not forget that the laptop case is made of plastic, which is reflected in its robustness. The completely balanced build and sleek lid ensure a pleasant feel. Weighing 2.36 kg (5.2 lbs) also makes it a perfect device for carrying around. 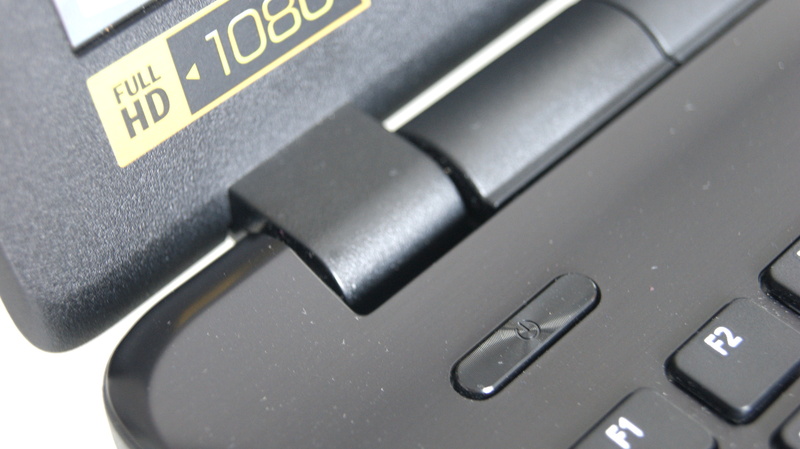 The diversity of ports only corresponds partially to today's standards of a 15.6-inch laptop. 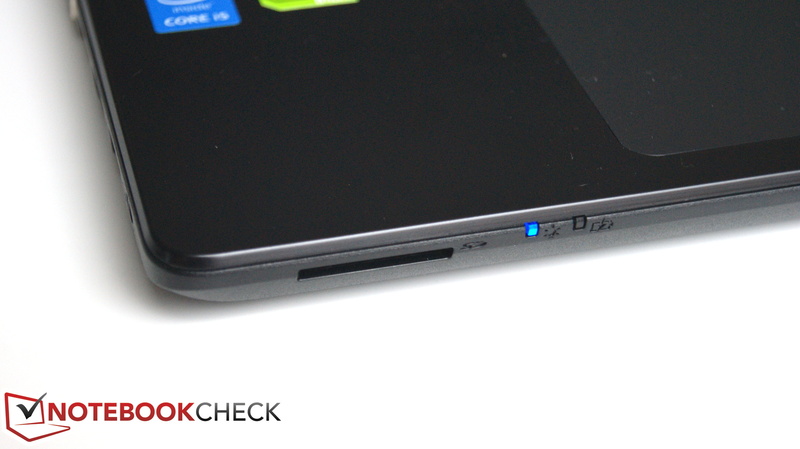 The Acer laptop is equipped quite poorly with just one USB 3.0 port and two USB 2.0 ports. They are positioned in the front area, allowing quick access. However, peripheral cables are also positioned in the front area, making it untidy and restrictive in terms of work space. A direct Wi-Fi comparison between a MacBook Pro Retina 13 (Late 2013) and the Aspire E5-571G clearly highlights the Acer’s flaws. Downloads are started automatically during the test in order to measure the average transmission rate. The scenario takes place one floor below the router. We obtained an average download of 7.8 - 8 Mbps from the MacBook and roughly half the speed, with 3.5 - 3.8 Mbps from the Aspire. These differences disappeared when the laptop was on the same floor as the router. Acer has installed a 1.3 MP webcam that provides smooth image rendering and color reproduction. The pictures remain well recognizable and smooth in dimmed surroundings despite strong image noise. Acer's Aspire E5-571 comes with only a few leaflets. Neither a device driver DVD nor a microfiber cloth is included. The underside is made of one single piece, which unfortunately does not have any maintenance covers. The innards can only be accessed by removing the keyboard unit, with care. This greatly complicates replacing or upgrading the storage device or working memory. Even the battery can only be removed with a tool - owing to a slide mechanism. The only positive aspect is that the components have not been glued. Acer includes a two-year pick-up & return service with a one-year International Travelers warranty. 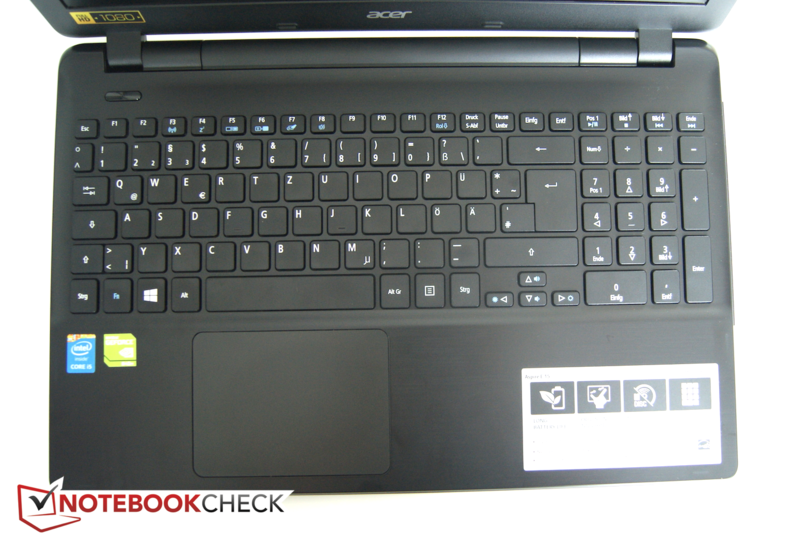 Acer uses a roughened chiclet keyboard with sufficient grip that enables easy touch typing in its E5-571. Although the keys clatter a bit and their mount is a slightly too soft, the keyboard makes a solid impression. The full-sized number pad makes it possible to work without an external device. The only significant difference is the smaller arrow keys that are found in most laptops of this size. Special keys or a backlight are regrettably not included in this line. The 10.6 x 7.8 cm (4.17-inch x 3-inch) sized touchpad scores with its sleekness and comfort. The integrated buttons feature an even pressure point that can also be reproduced via tapping with one or two fingers. Generally, it can be said that it is a good input device and is one of the best in this price range, including the smooth multi-touch operations. Again, a noteworthy flaw is found in scrolling. The response time lags for a moment and causes a minor jump or stutter. 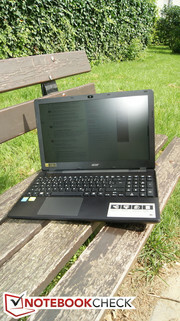 Overall, Acer still works with this touchpad. The screen is the biggest drawback. 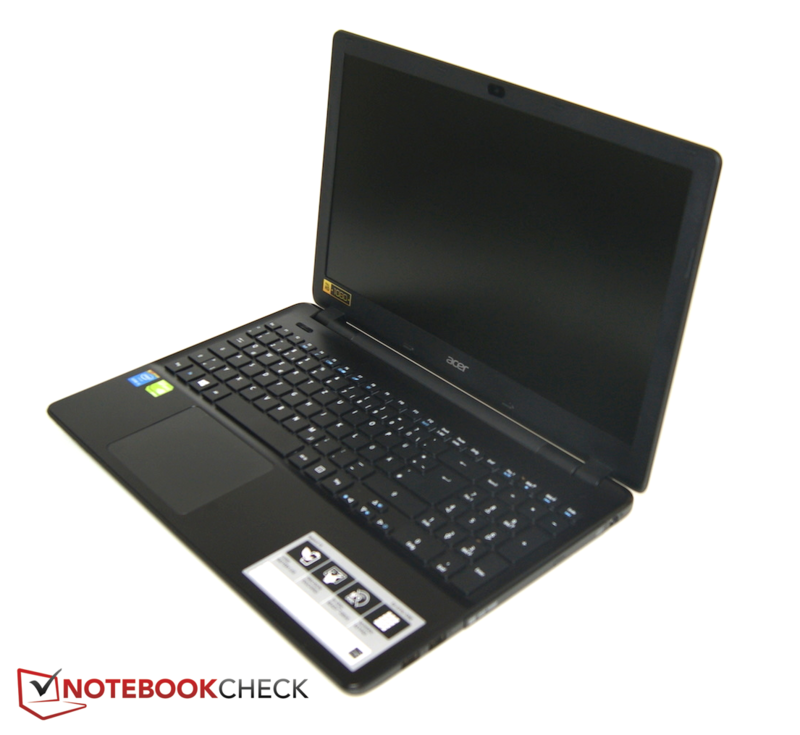 Acer has equipped its Aspire E5-571G-536E with a matte, 1920x1080 pixel Full HD screen. The TN display screen manufactured by AU Optronic, achieves an average brightness of 216.9 cd/m². This rate is almost 40% lower than the yearly average in this category. Massive deteriorations occur in battery mode, where an average of only 102.1 cd/m² is achieved. The Aspire V5-573G from the same manufacturer showed us a different side. It outperforms the E5 model with its high-quality IPS display screen and a brightness of up to 326 cd/m². The larger, 17-inch Acer Aspire E5-771G-553Q accomplished a remarkable result with a dramatically better screen rating for the same price. 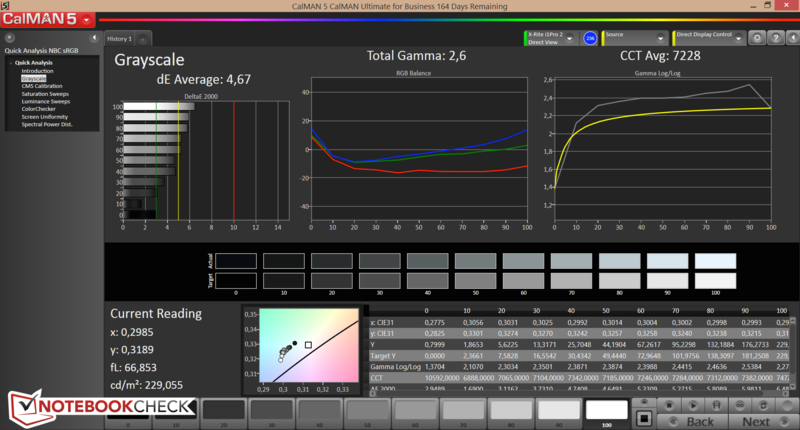 The findings in the brightness analysis continue in the contrast. 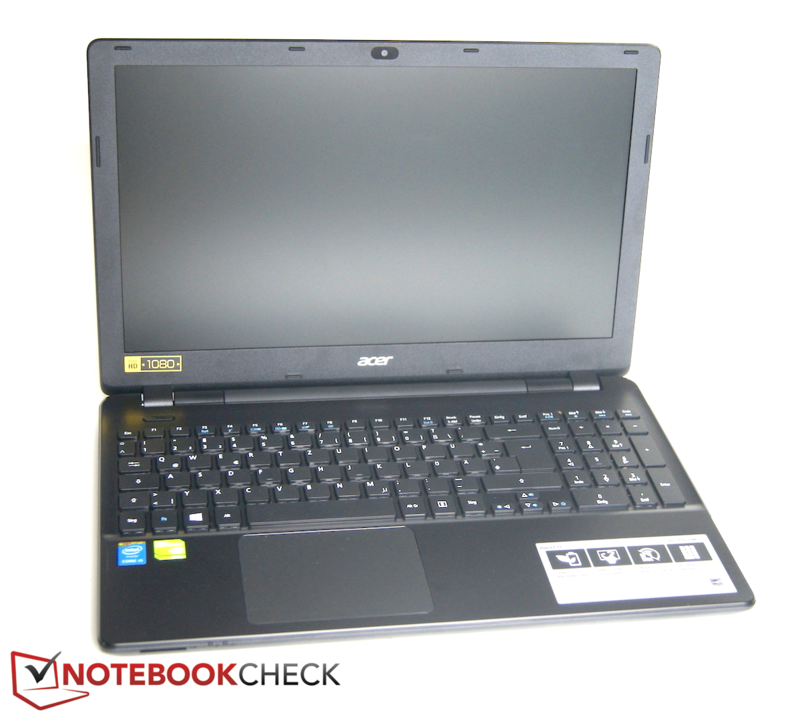 Acer's Aspire E5-571G lags behind all competitors with a ratio of 193:1. 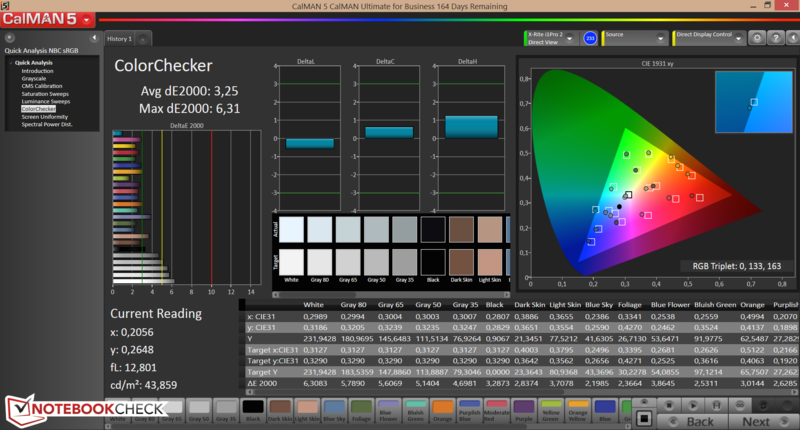 The virtually identical contrast and brightness ratios lead to a high black level of 1.1 cd/m². 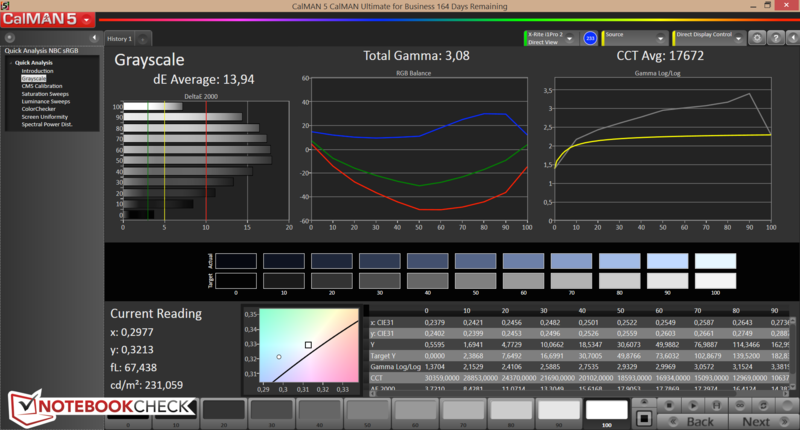 A look at the color space coverage shows that both the AdobeRGB space with 49.17% and sRGB space with 65.8% are missed. 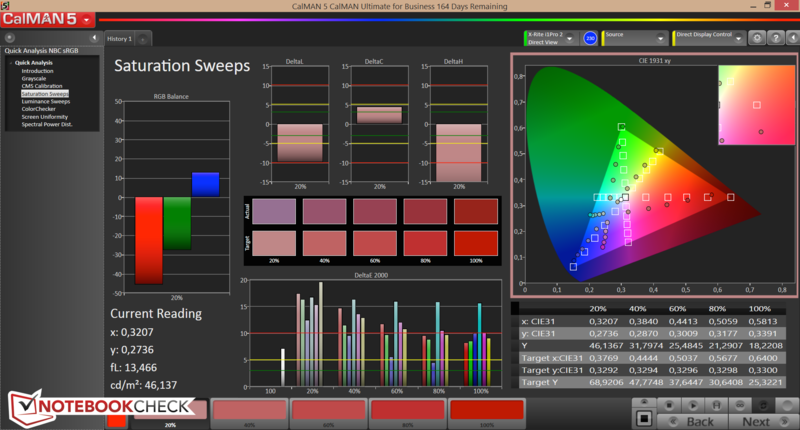 The analysis of the CalMAN results also reflect the display screen's weaknesses. The DeltaE deviation in the ColorChecker test is 12.14, and 13.94 in the Grayscale test. That is well above the multimedia average of 8.3 and 9.0. The result of this high shift in the grayscale is a clear bluish cast. Calibrating reduces the shift to 3.25 dE2000 and 4.67 dE. You might think that a matte screen was made for outdoor use. However, the screen's fairly poor results indicate that it is not suitable for use outdoors and can only be used outdoors in shady areas or heavily overcast skies. Now we look at the viewing angle stability. An initial positive point is that lateral viewing is possible without major distortion. 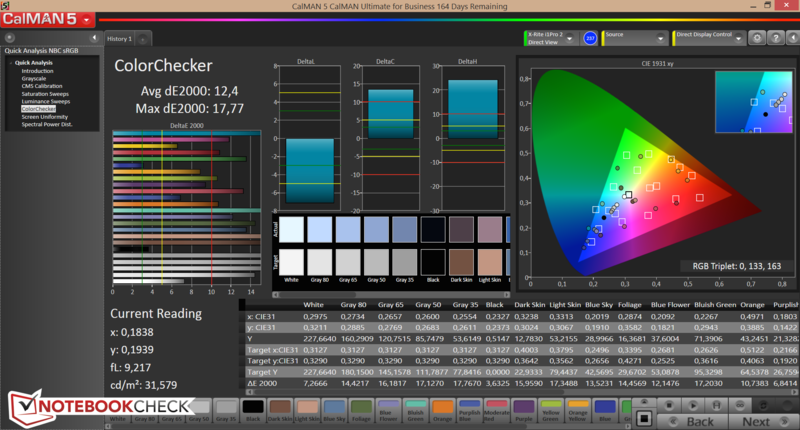 However, colors and the brightness deviate immensley as soon as the screen is tilted. 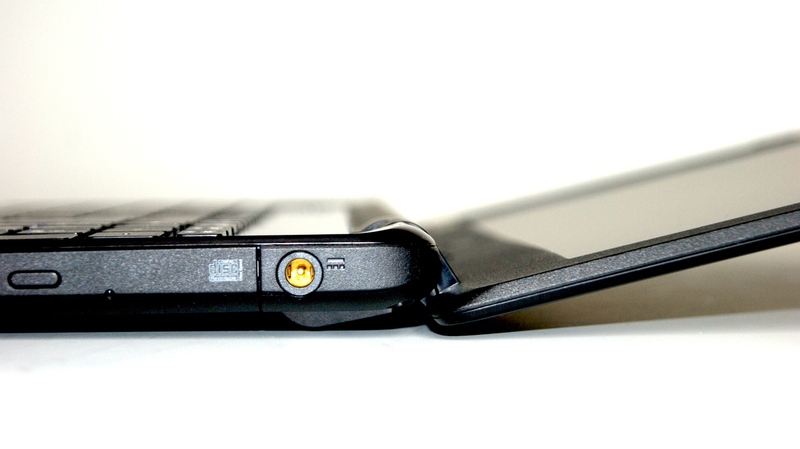 This effect is also noticed when using the laptop on the lap, and its opening angle of almost 180° does not help either. Acer has installed an Intel Core i5 processor to ensure enough computing power for everyday requirements. The dedicated graphics card also provides enough power, even for gaming enthusiasts. With these features, buyers will get an all-round multimedia device for 700 Euros (~$920). The new E5 model is equipped with an energy-efficient Intel Core i5-4210U dual-core CPU, a base speed clock of 1.7 GHz, and has an effective boost of 2.4 GHz. 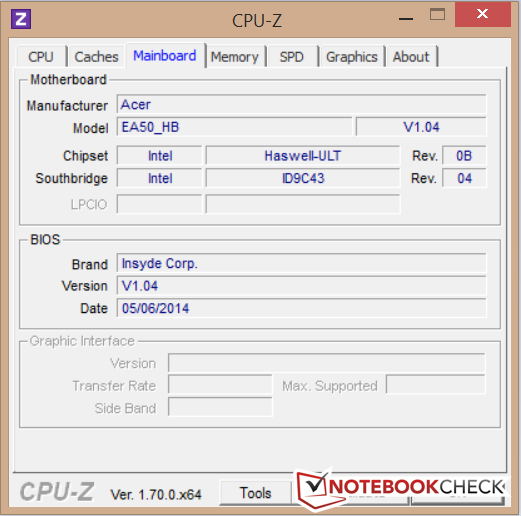 Further details about this Haswell processor range can be found in our database. MSI's GP60 is also equipped with an Intel Core i5 CPU, but with a significantly higher core clock of 2.8 GHz, and a considerably higher power consumption of 47 Wh (TDP). The comparison with both MSI's laptop and Asus' F550LN is interesting because they are powered by an Intel Core i7 ULV CPU, making the difference between the two CPU models more evident. 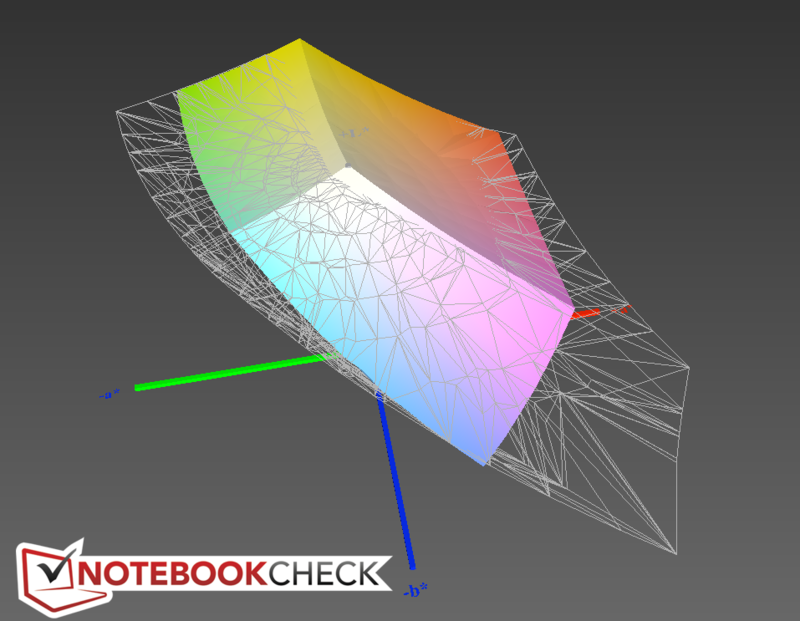 We look at the scores of Cinebench R15: With 325 points, MSI's laptop with the Intel Core i5-4200H achieves a clear lead over its rivals in the multi-core test. 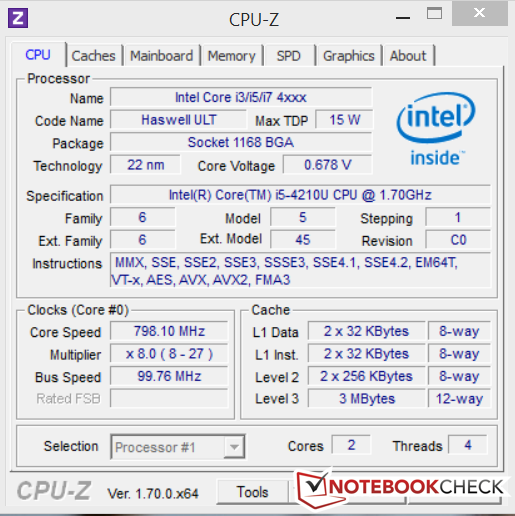 A score of 271 points, places the Intel Core i7-4500U CPU in Asus' laptop noticeably higher than the 215 and 226 points of Acer's device. Single-core operation reduces this difference. The leader, MSI's GP60, achieves a good 25% higher score with 128 points than Acer's Aspire E5-571G and 13% more than Asus' F550LN. There was no noticeable difference when performing Cinebench R15 in battery mode, although the CPU clock does not completely use the boost . The system runs smoothly, and all response times are acceptable overall. This also becomes evident in the PCMark 7 benchmark scores. Only Acer's Aspire V5-573G stands out owing to its hybrid hard drive. 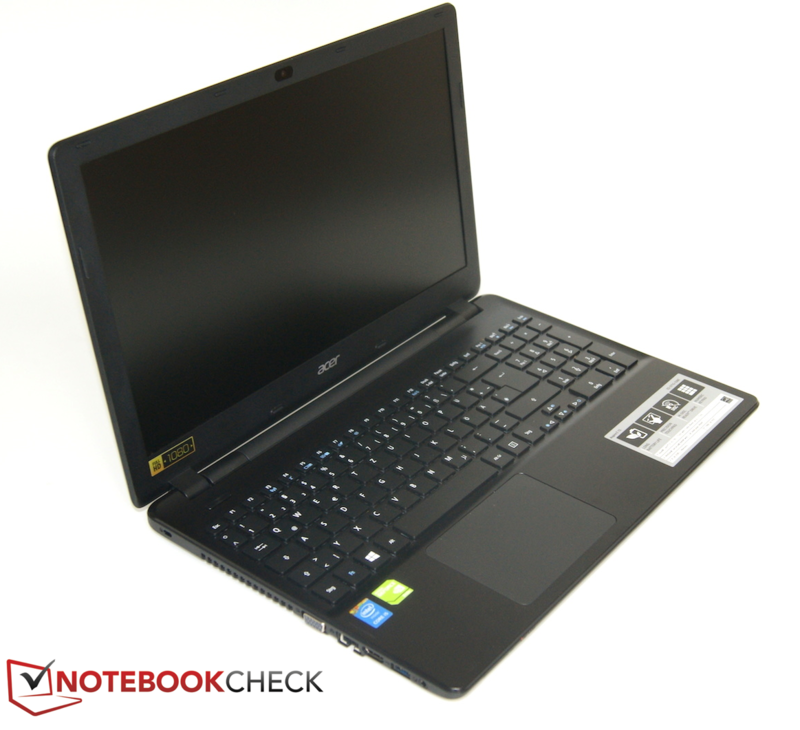 Acer equipped its Aspire E5-571G with a 5400 rpm Western Digital Scorpio Blue WD10JPVX, with 1 TB storage capacity. The average transfer rate of 85.5 MB/s in HD Tune is a normal rate for magnetic hard drives. 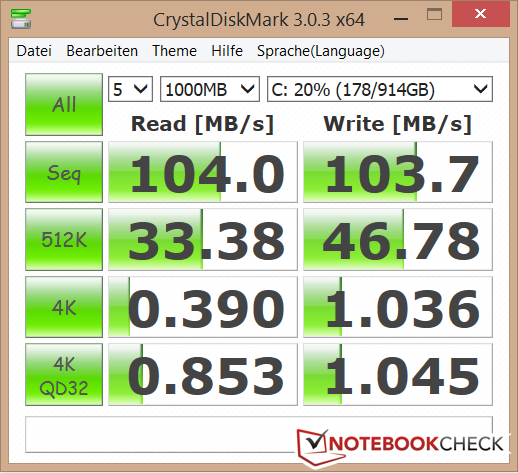 The read rate of 104 MB/s using CrystalDiskMark can be classified as quite decent. Further measurements, which are particularly interesting when exchanging the storage device, can be found in our database. A dedicated Nvidia GeForce 840M graphics card is installed in Acer's E5-571G for rendering images. In addition; the integrated Intel HD Graphics 4400 is responsible for low-requirement rendering. This ensures a battery-saving and smooth operation. 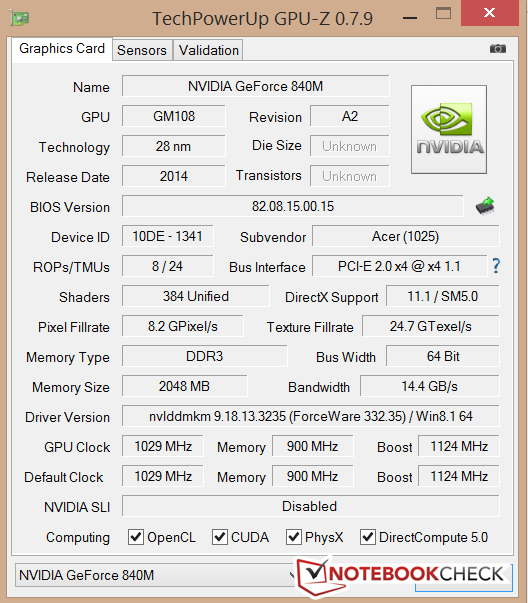 A popular application scenario of Nvidia's card is a slightly higher performance operation that allows playing up-to-date games in low or medium settings, and somewhat older games in high or maximum settings. In particular, the power consumption of just 30 Watts, enables using this card even in smaller laptops. It is interesting to compare the Acer Aspire V5-573G, with the 100 Euro (~$130) more expensive Nvidia GTX 850M installed, and the GeForce 840M. It will show whether the price difference is justified or even worthwhile. 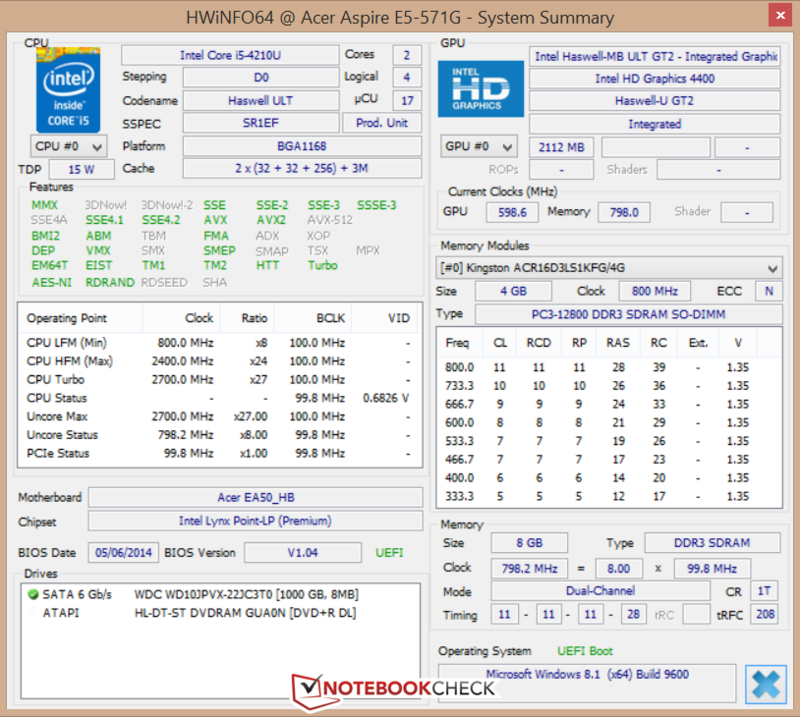 MSI's GP60 and Acer's E5-571G are on par initially. 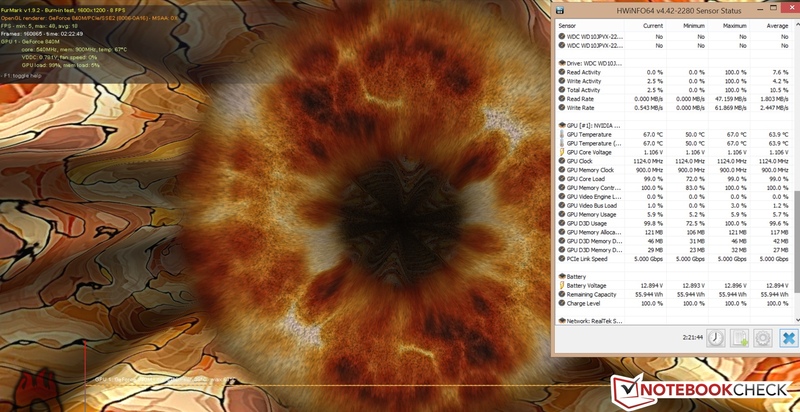 Owing to its faster CPU, Asus' F550LN achieves an approximately 11% higher score of 1,953 points in 3DMark 11. 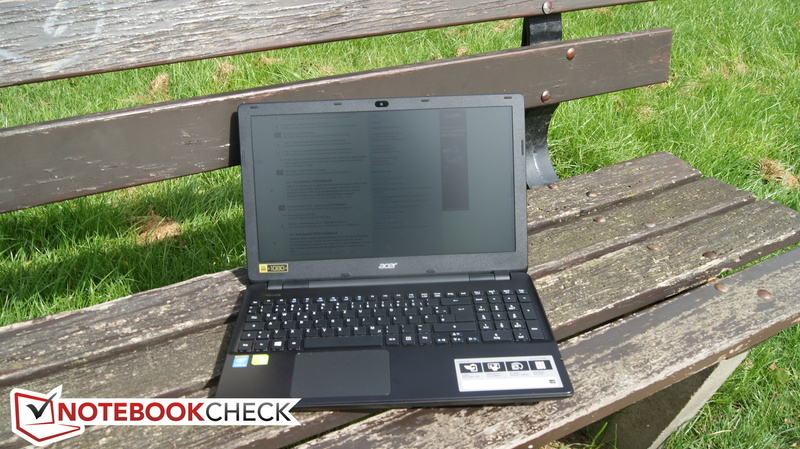 Acer's Aspire V5-573G can in fact clearly stand out. With 3,322 points and thus 89% higher, it achieves a considerable advantage. Gaming enthusiasts should consider this graphics card option. However, since these benchmarks do not always reflect the results of the gaming benchmarks, we will continue with this comparison in the next section. No significant difference was recorded in the 3DMark06 scores during mobile usage. The score of 10,018 is within the tolerance range of the benchmarks. A look at the gaming performance will provide information about graphic scenarios outside the benchmarks. At the same time, the comparison with the rivals will reveal whether the performance expected and required from the components is met. Bioshock Infinite can be played smoothly with 38.16 fps using high graphic settings according to the integrated benchmark. It is interesting that Asus' F550LN does not present any performance gains despite its Intel Core i7-4500U CPU. In contrast to the Intel Core i5-4200H in MSI's GP60, we can obtain approximately 15% more frames per second. Acer's Aspire V5-573G continues to stand out, owing to its considerably higher-performing Nvidia GTX 850 with an average of 71% higher frame rates. The test with the performance devouring Company of Heroes 2 exhibits similar results. 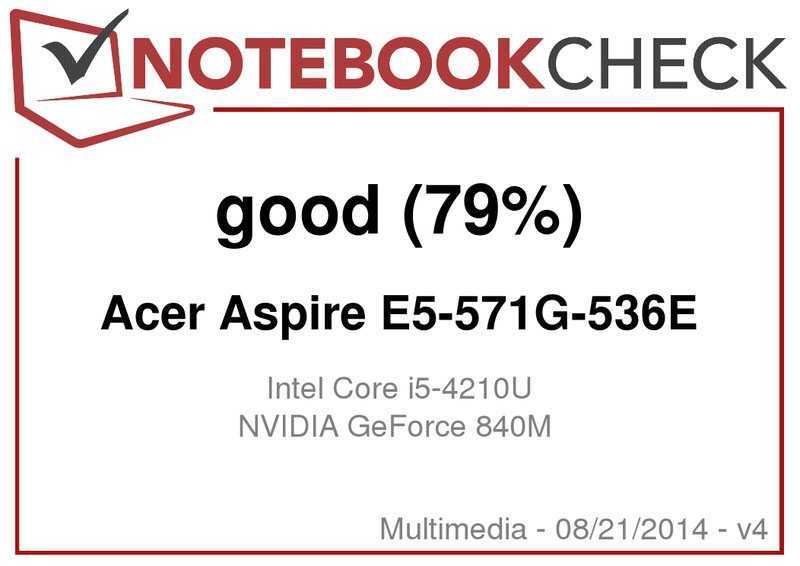 Acer's Aspire E5-571G is slightly below the average of tested laptops with Nvidia's GeForce 840M. Nevertheless, the game can still just be rendered smoothly with 30 fps in minimum settings. It is barely playable when the settings are increased to the next level, i.e. medium graphic settings. The comparison model from MSI again scores better with 28.33 fps and Acer's Aspire V5-573G once more achieves an even better result with 34.6 fps. A look at newer games like Grid: Autosport, Wolfenstein: The New Order or Risen 3: Titan Lords confirm the suitability of Acer's Aspire E5-571G even for playing present and future games, though with the restriction that games will only be rendered in low or medium settings. We refer to our FAQ for more gaming benchmarks relating to Nvidia's GeForce 840M and other graphics card comparisons. The noise emission of Acer's laptop always remains moderate. Idle mode is only audible as a barely perceptible hum. In contrast, Acer's 17-inch model is audibly louder despite its larger size. 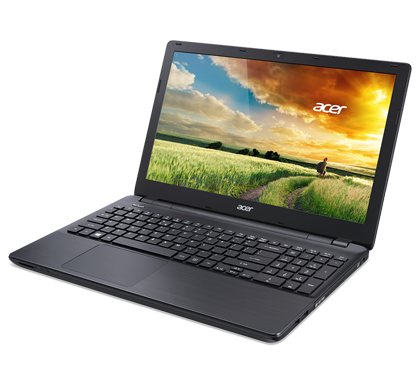 The load operation is very demanding in the Acer, but it is also exemplary here compared with its rivals. 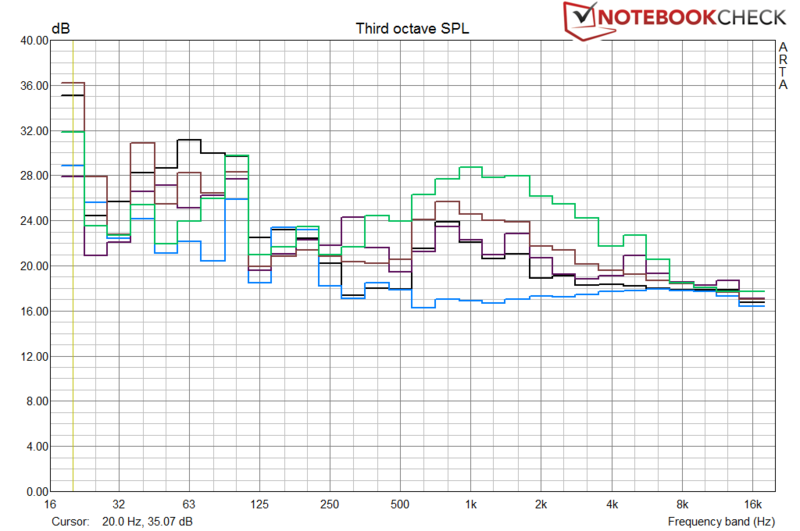 MSI's GP60 is considerably louder with 36.2 - 50 dB(A) in contrast to the 32.5 - 36 dB(A) of Acer's laptop. The other rivals cannot compete with this either. We observed some deviations in load operation where we noticed a consistent fluctuation between two levels rather than a stable fan speed. You might assume that the low noise level would affect the temperature build up adversely. However, fortunately this is not the case. The hottest spot is achieved on the underside's center with 43 °C (109.4 °F), and is not uncomfortable to use on the lap. Agreeably, Acer's device mostly remains below 40 °C (104 °F) during load. 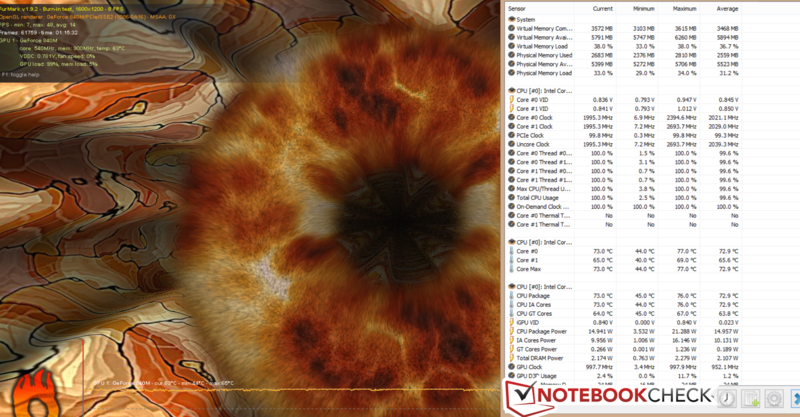 A look at Acer's Aspire V5-573G for comparison: temperatures of up to 52 °C (125.6 °F) are achieved with the dedicated Nvidia GeForce GTX 850M, which is considerably higher and might affect use. 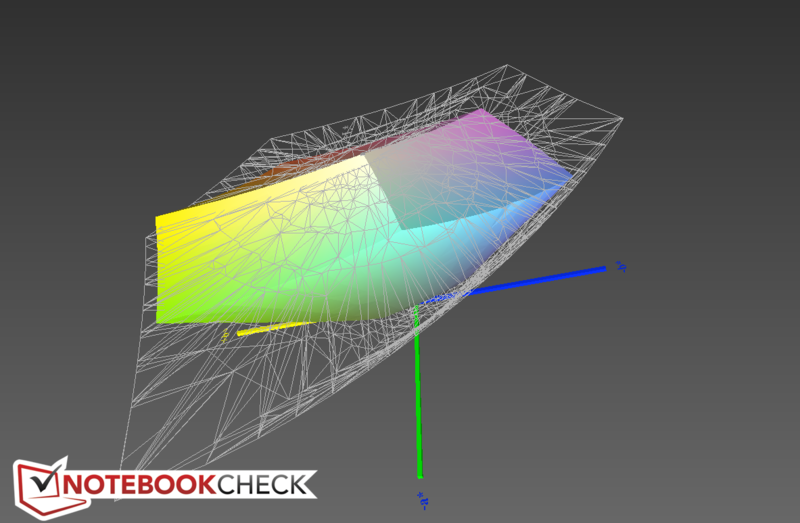 Only Asus' F550LN surprisingly remains below 40 °C most of the time even during load. The stress test that we perform using FurMark and Prime95 highlights any changes in clock frequency and performance stability. We did not discover any throttling, i.e. undercutting the base clock. 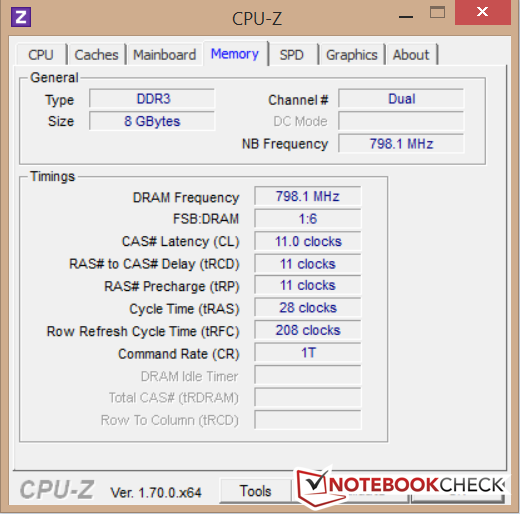 The CPU's clock settled to 2100 MHz after one hour. Furthermore, according to 3DMark 6 there was no performance deterioration. 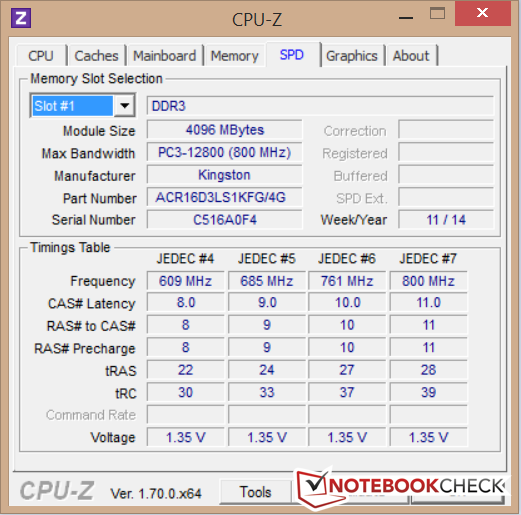 Acer's Aspire 571G still achieved 10,163 points after the stress test. 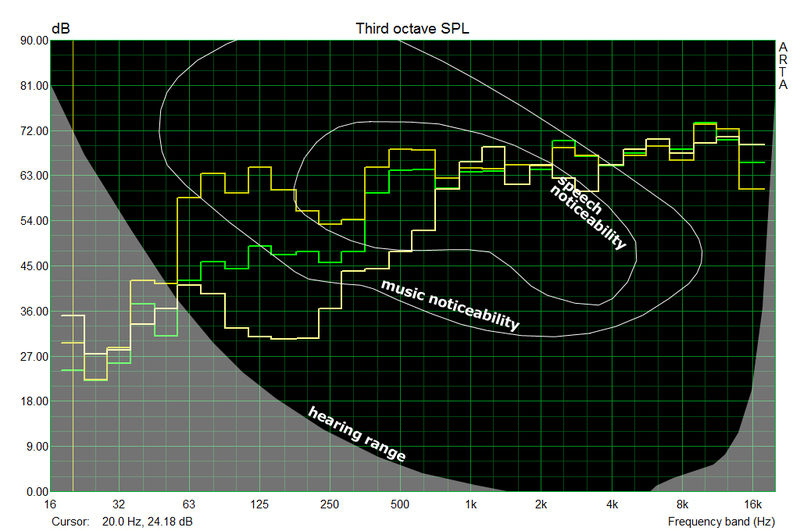 The first subjective impression of the speakers highlights the typical weaknesses in the sound spectrum of laptops. We did not identify any bass. 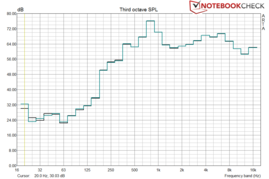 The frequency graph provides detailed insight about the distribution. A constant line would be ideal. 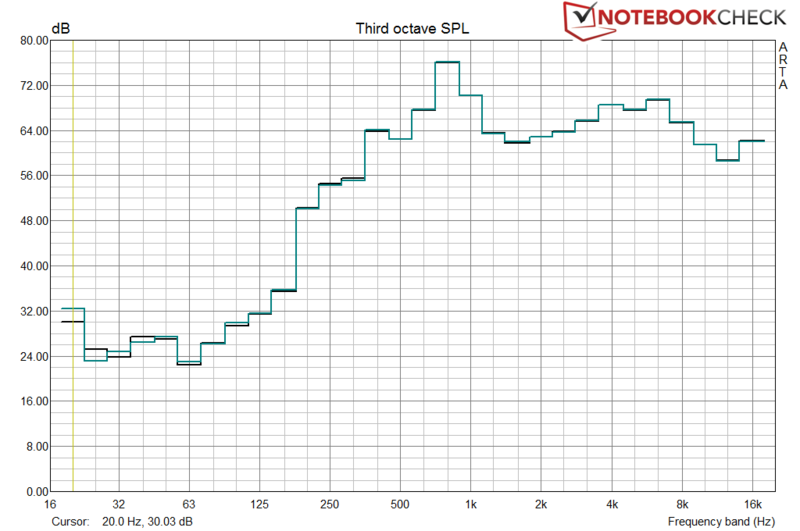 In our case, we recorded a volume of up to 90 dB(A) in the center mids. The pink noise is compared with a mid-range 2.1 sound system in the second example. The power consumption during idling is low owing to the ULV CPU, and is on par with the comparison devices. The differences of the various hardware configurations are seen in load operation. 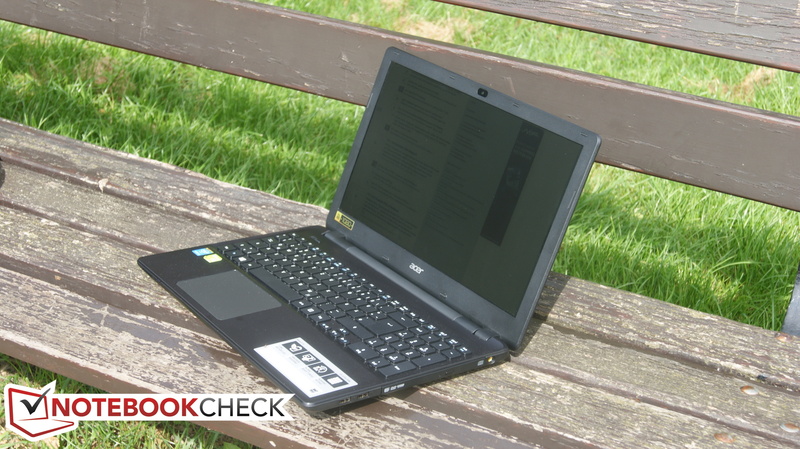 The required 38.2 - 50.1 Watts of Acer's laptop is below that of its rivals. 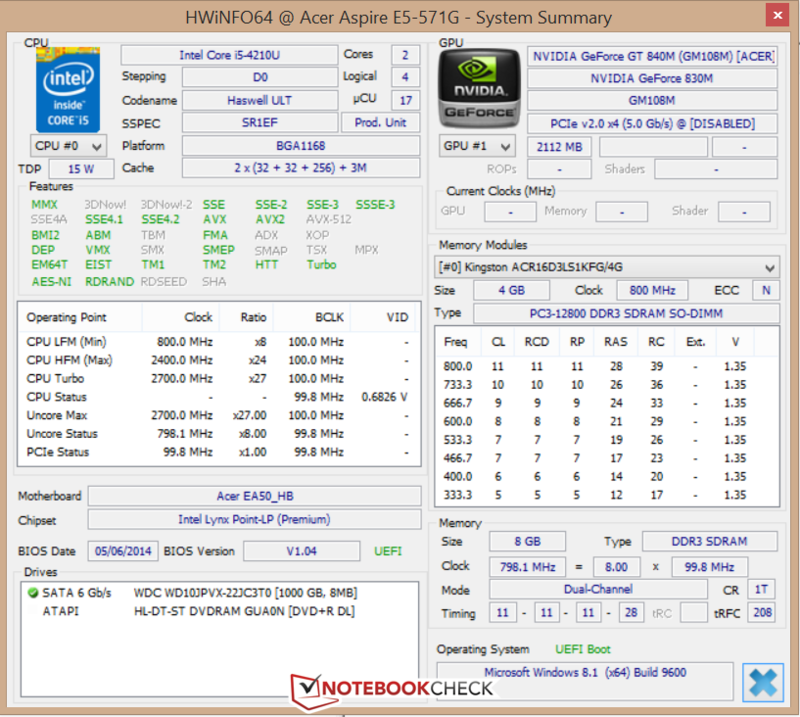 Acer's Aspire V5-573G with its Nvidia GeForce GTX 850M gets particularly thirsty with 54 to 85.9 Watts. The high-performance MSI GP60 follows with a power consumption of 50.8 - 74.5 Watts as it is not equipped with a ULV CPU. 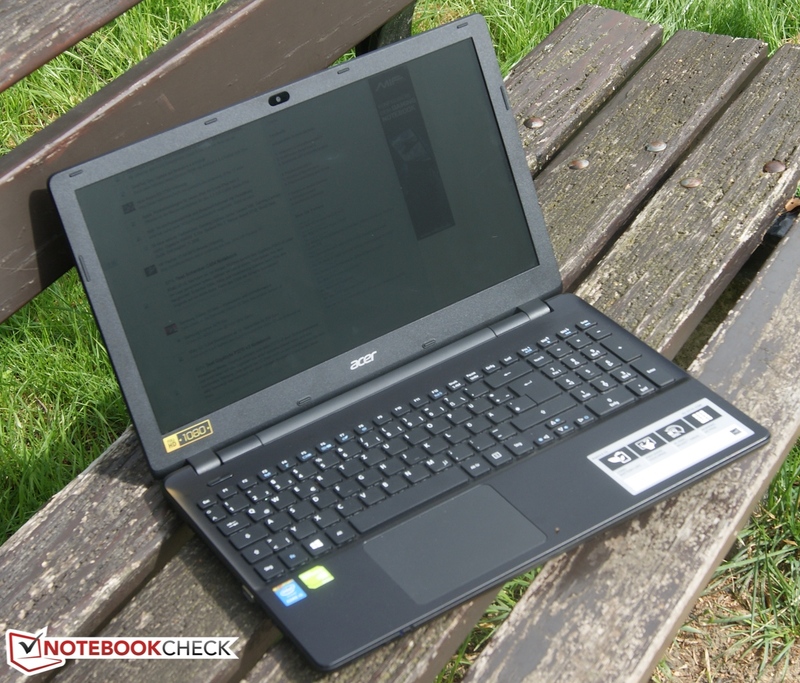 Acer specifies a battery runtime of up to 7 hours in its data sheet, which we checked. First, we performed our idle test, simulating reading text documents under minimal light conditions. The six-cell battery stopped work after 11.13 h, a significant increase compared to its similarly configured rival MSI GP60 that reached only 6 hours. The standard voltage powered Asus F550LN lasts an hour more, with 7:17 h. The combination of a dedicated and internal graphics card allows Acer's Aspire V5-573G an identical runtime of 10:24 h despite the Nvidia GeForce GTX 850M. The Wi-Fi test simulates browsing on websites using a specified brightness. A different page is opened every 40 seconds. Here, Acer's laptop achieves 5:35 h, which will not be a full working day. 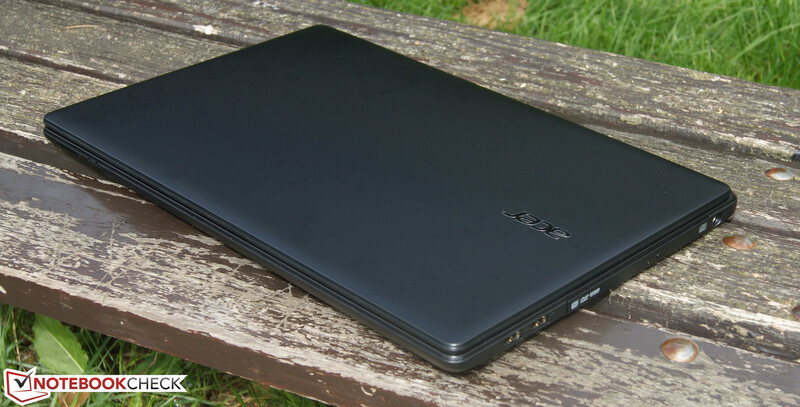 Still, the Acer Aspire V5-571G lasts an impressive 1:30 h longer than both MSI's GP60 and Asus' F550LN. The load test is performed using Battery Eater. It stopped Acer's E5-571G after 2:14 h, which is scarcely the first place in this test procedure. 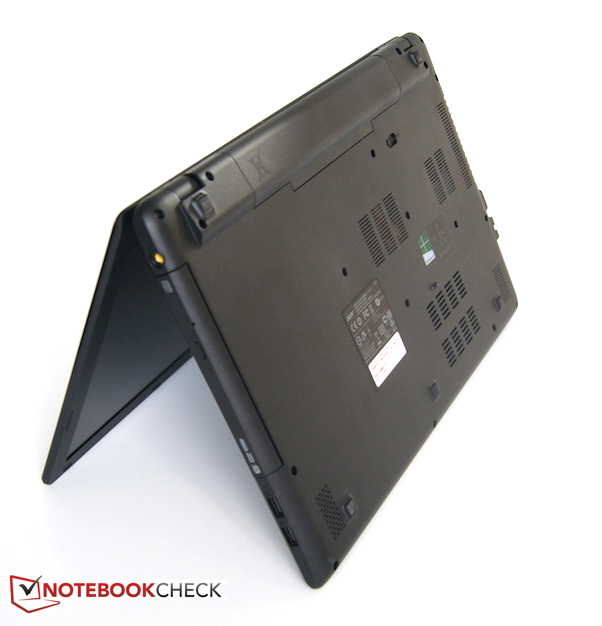 Finally, we will summarize the test of Acer's laptop and combine all previous criteria. For 700 Euros (~$920), we get a laptop equipped for many application scenarios that stands out with pleasing input devices (especially the touchpad) in this price range. The combination of Nvidia's GeForce 840M and Intel's Core i5-4210U processor, provide power when it is needed. Even the battery life is sufficiently acceptable - particularly when compared with the competition. When necessary, the battery will last for a full working day, which cannot be said of its rivals. On the other hand, we now look at the criteria that are not obvious before purchase. First, the display screen's brightness and contrast are quite poor. The 50% decrease in battery mode is significant. Furthermore, the buyer should know that Acer has made maintainability difficult in all aspects. Replacing the working memory or hard drive will be awkward. Finally, potential buyers should always be aware that although the device has grip, is pleasant to hold, and looks like aluminum it is only plastic. Setting aside these factors, it remains a solid laptop. 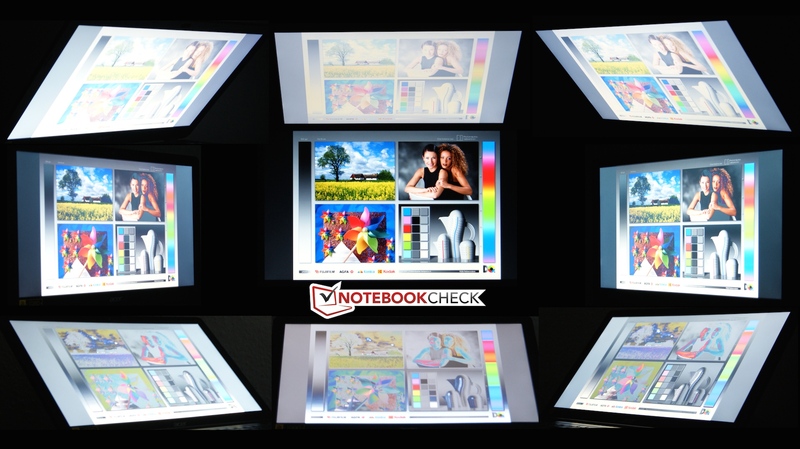 However, should the display screen be deterring, and more graphics power is needed from the outset, you should definitely look at Acer's Aspire V5-573G. A full-sized number pad is installed. The battery can be removed easily with a tool. The installed camera is sufficient for transmitting smooth images. The DVD drive does not close flush. Comparison of interfaces with the big 17-inch model. 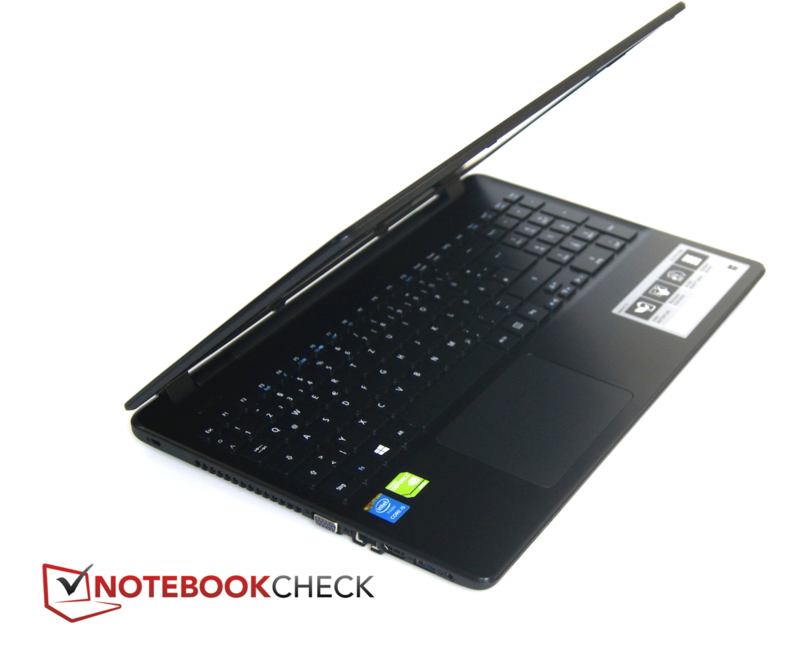 Acer's laptop can deliver with remarkable input devices and good performance for 700 Euros. Furthermore, it stays pleasantly quiet and cool. We'd particularly like to see a better screen with a considerably higher brightness and contrast. Maintenance covers for replacing fundamental components should actually also be available. 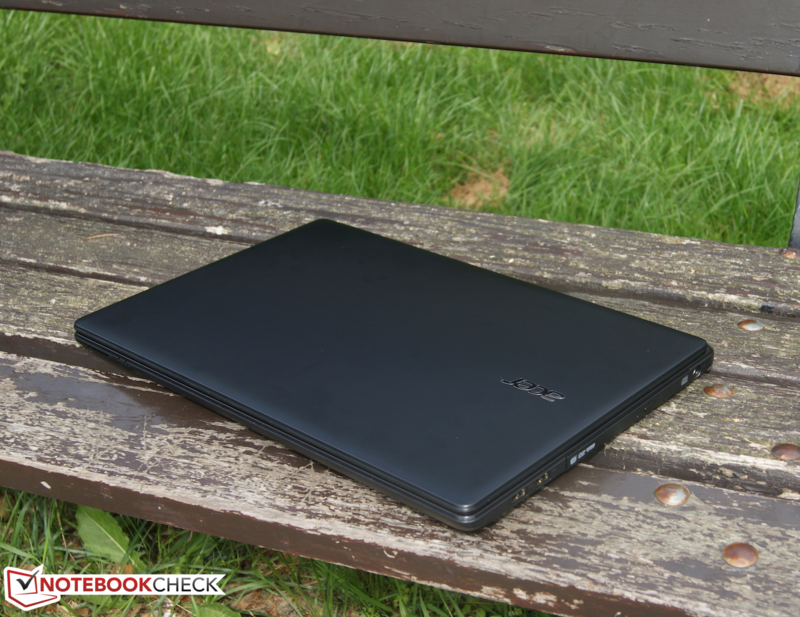 Acer's laptop almost consistently achieves solid results, which thus makes it interesting for many potential buyers. Among the contenders, we first look at MSI's GP60 that is qualified owing to identical components. 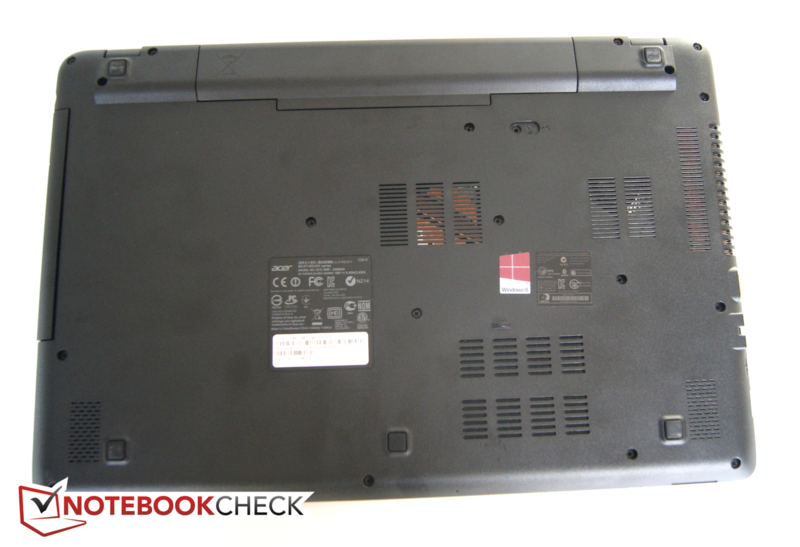 To see what consequences minor price differences have, we also look at two other laptops that might influence the buyer's purchase decision by certain hardware improvements: Asus' F550LN and Acer's Aspire V5-573G.